Everyone seems to love 8-bit these days, but what about 16-bit? Often, it seems that the retro gaming subculture overlooks 16-bit home computers in favor of same generation consoles, such as the Sega Genesis. 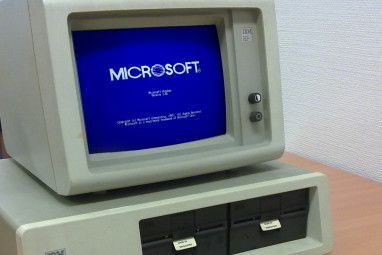 But back in the mid-1980s, when the 16-bit computers arrived, it was a massive change. By modern standards, the graphics aren’t a massive development, but at the time its release represented a massive technological paradigm shift! One device stood out: The Commodore Amiga, an attractive, popular computer with stunning graphics, good audio and a useful desktop environment. A number of different versions were released between 1985 and 1991, all fondly remembered by fans. 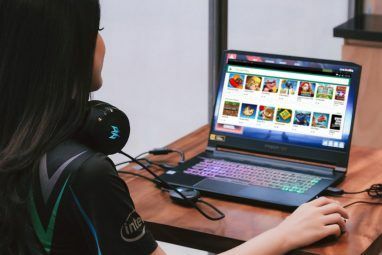 You’re thinking about installing and emulator, but which games should you take a look at? Our list should give you some ideas. Any game from the Turrican series could sit comfortably in this list, one of the finest 16-bit shooters of all. Turrican II: The Final Fight sees a return of the armored all-purpose battle suit. Packed with a variety of awesome weapons, you also have the ability to turn into a gyroscope. This is vital for negotiating tight squeezes and finding extra lives and power ups. Turrican II is one of the most engrossing platform shooters on any platform, and particularly shines on the Amiga. You might also consider the original Turrican, sequel Turrican 3 (also known as Mega Turrican). Also worth checking out is Universal Solider, a movie tie-in that used much of the Turrican 2 code and graphics. This is one of the most revolutionary games from the 16-bit era. Out of this World is an action platformer that features a scientist, Lester, fighting for survival in an alien dimension. An influential title that employed cinematic cutscenes and gameplay, Out of this World‘s legacy is felt in many subsequent games. Offering a realistic, perilous challenge, Lester is killed instantly upon injury, necessitating the use of checkpoints. As there is no save option, a checkpoint code must be noted in order to return to the action later. A sequel to the popular Utopia, futuristic K240 places you in charge of a remote asteroid mining project. The aim is to extract minerals for company profit, while building enough habitation units to manage your space-based population. You’ll also need to build a military to defend them against aggressive alien rivals! A popular feature is the ability to design your own military units to gain the upper hand against the aliens. Several scenarios and levels are included, each more challenging than the one before — and requiring different tactics, too. A strong strategic gaming experience, K240 will eat up hours of your time once the game gets going. Admittedly, this is two games (by developer Dino Dini) but they have a considerable degree of integration for the era. Kick Off 2, the sequel to Kick Off, is a top-down scrolling soccer game that preceded Sensible Soccer Top 5 Football (Soccer) Games You've Probably Never Played But Should Top 5 Football (Soccer) Games You've Probably Never Played But Should If you feel as though you've played the latest, high-profile titles to death, there are alternatives for the armchair pro tired of FIFA, PES, Football Manager, and the rest. Read More . The controls are slightly more sophisticated than Sensi, however, resulting in a more intensive gaming experience. It’s fun, addictive, and various expansion packs with new tactics and competitions were released, also available as ROMs. Player Manager is, as the name suggests, a soccer management sim with an arcade element. Rather than known footballers, the game features fake players with randomly generated stats, ready to be trained. Until Championship Manager (and later, Football Manager Football Manager 2014: A Worthy Addition To The Long-Running Series Football Manager 2014: A Worthy Addition To The Long-Running Series Football Manager 2014 is out now – but what does this latest addition to the long-running soccer management simulation and statistics game bring to the table? Is silverware within reach if you upgrade? Read More ) came along, Player Manager was THE football management sim, and still stands up well 25 years later. The export function on Player Manager was designed to let you transfer your teams and tactics to Kick Off 2. Meanwhile, if you want to play Kick Off 2 without installing a separate emulator, you can! 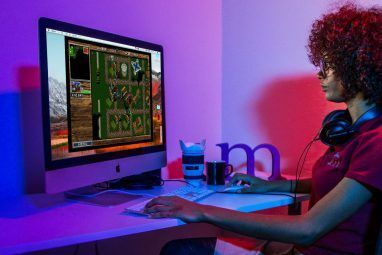 Still popular today, Worms — one of the stand-out titles in the latter days of the Amiga’s popularity — owes its success to its sense of humor. Mouse-controlled, slick and with a unique visual charm, the original Worms plays as well as any of the recent updates Worms 3: Finally, A Proper Worms Game For iPhone & iPad Worms 3: Finally, A Proper Worms Game For iPhone & iPad Team 17 originally released Worms for the Amiga in 1995, and it didn't take long before the world took note and the game was ported to the PC, PlayStation and even the GameBoy. Now, nearly... Read More . In short, once you’ve started playing, you’ll probably never stop. One of the few turn-based two player games on the Amiga, it’s still great fun! A 2D, point-and-click adventure game from Lucasfilm Games, you guide wannabe pirate Guybrush Threepwood through his adventure on Melee Island. Inspired by Disney’s Pirates of the Caribbean ride, The Secret of Monkey Island is a much-loved retro gaming experience. It even spawned a sequel, LeChuck’s Revenge, and had a latter-day re-release in 2009 (you’ll find it on Steam). As with many games from the 16-bit era, The Secret of Monkey Island uses the ScummVM adventure game engine. If you can get to grips with this game, a whole world of point-and-click adventure gaming awaits SCUMMVM - A Point-And-Click Adventure Game Emulator SCUMMVM - A Point-And-Click Adventure Game Emulator Read More ! Many describe Elite: Dangerous 6 Mind-Blowing Ways To Take Elite Dangerous to the Next Level 6 Mind-Blowing Ways To Take Elite Dangerous to the Next Level It's hard to get immersed in space sims with your hands on a keyboard or controller and your eyes on a mundane screen. Here are some ways of enhancing your time with Elite Dangerous! Read More as the sequel to David Braben’s Elite, but in fact there have been a couple before it. The most notable was Frontier: Elite II, the first game to feature procedural-generated star systems (hello, No Man’s Sky No Man's Sky and the Future of Procedural Games No Man's Sky and the Future of Procedural Games If you haven't heard of No Man's Sky yet, you're missing out. This open-world adventure game is set to pioneer a new standard in procedural generation, a topic that's deeply interesting even if you don't... Read More ! ), alongside the same open-ended gameplay that was found in the original 8-bit game. Beginning with modest resources, your aim is to earn money by whatever means possible. This might mean trading (a good opening strategy) or smuggling, bounty hunting, gun running or even slave transport, working for one of the opposing galactic powers… the choices are endless. More money means a bigger, more powerful ship, of course, which means there can be a bit of a grind to earn money for the initial upgrades. 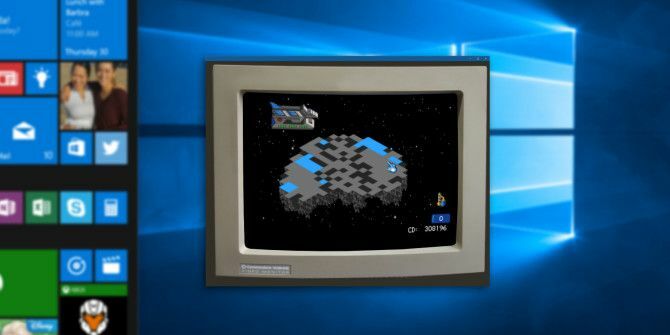 All in all, Frontier: Elite II is a fun, immersive gaming experience, perfect fare for an Amiga emulator. If you’ve ever seen the 1975 movie Rollerball (or its modern day remake), then the idea of guys in futuristic armor running around an arena attempting to score points with a palm-sized, solid metal globe should not be unfamiliar. Several versions and sequels to this 1990 game have been released, in which you guide a team of nine players to victory in a league competition. It’s high-octane stuff, with a two-player mode, but the single player option puts you in the role of team manager, too, so there’s plenty of options to keep the entertainment levels high. Fancy this, but don’t want to run it in an emulator? Speedball 2 HD is for available for Windows exclusively through Steam, with HD graphics. The progenitor of the Command & Conquer series of top-down capture-the-castle strategy games, Dune II: The Building of a Dynasty (known as Dune II: The Battle for Arrakis in the UK and Europe), this real-time strategy game lets you choose to be commander of one of three factions vying for supremacy on the planet Arrakis. At the center of all of this is the spice that is harvested from the desert using a dedicated vehicle; the valuable resource can then be used to generate credits for military units to dominate the field of play. Gameplay focuses on the now-standard procedure of building a base, gathering resources, building units, engaging the enemy and developing a strategy to win. Great fun, but it may eat up a lot of your time. Snooker, pool, and billiards video games have never really taken off. After all, they tend to lack the real-world excitement of successfully potting, clearing the table and hustling the opposition. Originally planned with the more modest title of “147” before being slapped with a celebrity endorsement from the perennially popular, world championship-dodging, Jimmy White, Whirlwind Snooker somehow manages to capture every other element of the game. There’s a certain amount of humor in the game, especially if you’re slow to take a shot, with the balls suddenly gaining mocking, cartoon faces. Follow ups included Archer MacLean’s Pool. We’ve offered a list that spans the Amiga era, most popular from 1985–1999 and it was very tough reducing a vast library of titles to just ten. If we included honorable mentions, the list would suddenly increase to 30! Do you have a favorite Amiga game to add to this list? Tell us what you’re thinking in the comments. Honestly while I loved K240 back on my real Amiga it hadnt stood the test of time well when I fired it up recently. The UI is just too painful. Also Supercars II is a must play. So many awesome games from the Amiga. thank you for list but 4 out of 10 games are already on pc. Another World is must try if you like frustrating gameplay. Also there is a fanmade game Hurrican which is clone of Turrican. Admittedly, but they're also better on Amiga, IMO. Hurrican is great! Another World Anniversary Edition on PS4 is as good as the original if not better. Don't know how well it plays on PC.